Technological and socioeconomic interventions accompanied by climate warming strongly dictate farming practices, lending a direct impact over future irrigation water demand and supply. 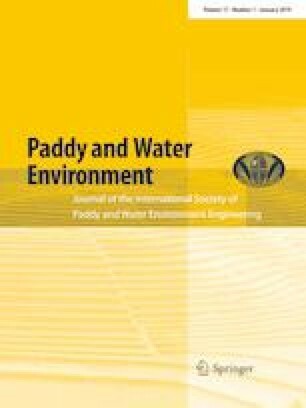 In this article, two pivotal factors of farming practices and climate change were included to assess their role in the future paddy water management of Korea. Field surveys were conducted across irrigated areas of twelve agricultural reservoirs to distinguish traditional and current paddy farming practices. Projected climate for two future time slices the 2060s (2020 to 2059) and the 2100s (2060 to 2100) under two representative concentration pathway scenarios (4.5 and 8.5) were used for climate change impact assessment. Crop evapotranspiration (ETc), effective rainfall, gross duty of water (GDW) and annual inflow were simulated from 1987 to 2100 under both farming practices. Future climate projections suggested a continuous warming trend accompanied by distinctively negative/positive shifts in central/southern region annual rainfall by the end of the twenty-first century. Annual inflow in the central (southern) region reservoirs exhibited downward (upward) trends during the 2060s and only upward trends during the 2100s, respectively, whereas rice ETc showed upward tendencies regardless of the farming practices. Rice season effective rainfall varied for different reservoirs mostly showing increasing tendencies. The GDW increased implying that projected positive rainfall shifts might not withhold the driving impacts of temperature rise over regional irrigation water demands. Following the traditional farming practices in future would intensify the anticipated rise in irrigation demand and may lead to water shortages given the present storage capacities of agricultural reservoirs. This research was supported by the Korea Rural Research Institution (KRRI). The views expressed in this paper are those of the authors and do not necessarily reflect the views of KRRI or any of its sub-agencies.